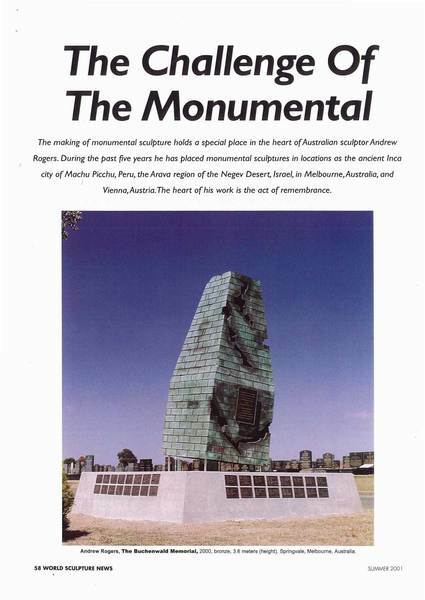 The making of monumental sculpture holds a special place in the heart of Australian sculptor Andrew Rogers. 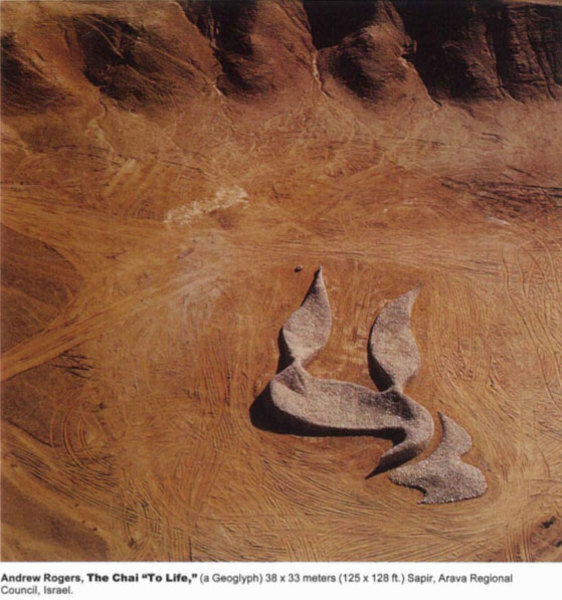 During the past five years he has placed monumental sculptures in locations as the ancient Inca city of Machu Picchu, Peru, the Arava region of the Negev Desert, Israel, in Melbourne, Australia, and Vienna, Austria. The heart of his work is the act of remembrance. 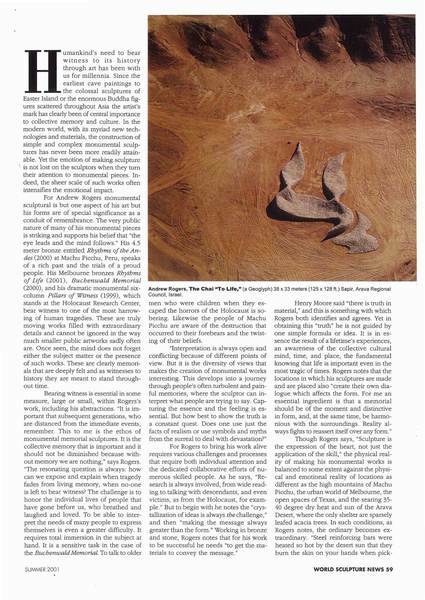 Humankind’s need to bear witness to its history through art has been with us for millennia. Since the earliest cave paintings to the colossal sculptures of Easter Island or the enormous Buddha figures scattered throughout Asia the artist’s mark has clearly been of central importance to collective memory and culture. In the modern world, with its myriad new technologies and materials, the construction of simple and complex monumental sculptures has never been more readily attainable. 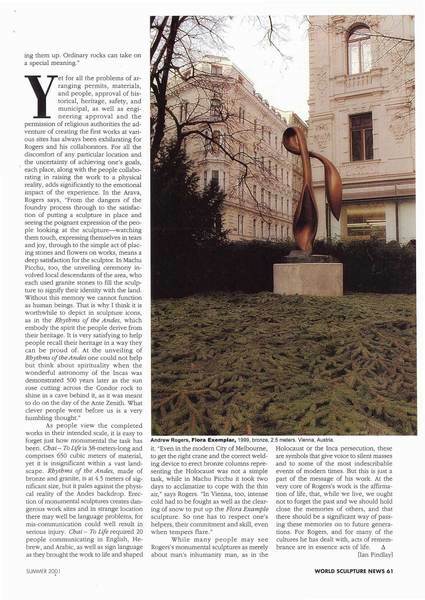 Yet the emotion of making sculpture is not lost on the sculptors when they turn their attention to monumental pieces. Indeed, the sheer scale of such works often intensifies the emotional impact. For Andrew Rogers monumental sculptural is but one aspect of his art but his forms are of special significance as a conduit of remembrance. The very public nature of many of his monumental pieces is striking and supports his belief that “the eye leads and the mind follows.” His 4.5 meter bronze entitled Rhythms of the Andes (2000) at Machu Picchu, Peru, speaks of a rich past and the trials of a proud people. 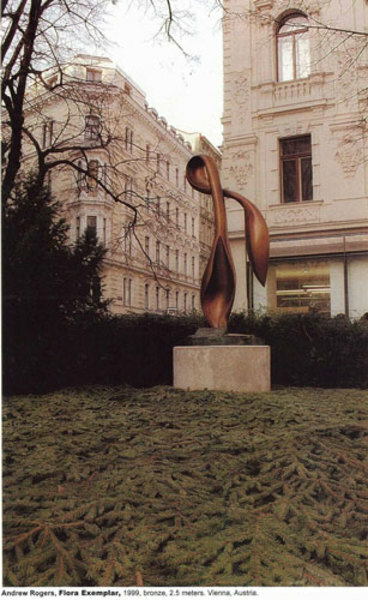 His Melbourne bronzes Rhythms of Life (2001), Buchenwald Memorial (2000), and his dramatic monumental six column Pillars of Witness (1999), which stands at the Holocaust Research Center, bear witness to one of the most harrowing of human tragedies. These are truly moving works filled with extraordinary details and cannot be ignored in the way much smaller public artworks sadly often are. Once seen, the mind does not forget either the subject matter or the presence of such works. These are clearly memorials that are deeply felt and as witnesses to history they are meant to stand throughout time. Bearing witness is essential in some measure, large or small, within Rogers’s work, including his abstractions. “It is important that subsequent generations, who are distanced from the immediate events, remember. This to me is the ethos of monumental memorial sculptures. It is the collective memory that is important and it should not be diminished because without memory we are nothing,” says Rogers. “The resonating question is always: how can we expose and explain when tragedy fades from living memory, when no-one is left to bear witness? The challenge is to honor the individual lives of people that have gone before us, who breathed and laughed and loved. To be able to interpret the needs of many people to express themselves is even a greater difficulty. It requires total immersion in the subject at hand. It is a sensitive task in the case of the Buchenwald Memorial. To talk to older men who were children when they escaped the horrors of the Holocaust is sobering. Likewise the people of Machu Picchu are aware of the destruction that occurred to their forebears and the twisting of their beliefs. Though Rogers says, “Sculpture is the expression of the heart, not just the application of the skill,” the physical reality of making his monumental works is balanced to some extent against the physical and emotional reality of locations as different as the high mountains of Machu Picchu, the urban world of Melbourne, the open spaces of Texas, and the searing 3540 degree dry heat and sun of the Arava Desert, where the only shelter are sparsely leafed acacia trees. In such conditions, as Rogers notes, the ordinary becomes extraordinary. While many people may see Rogers’s monumental sculptures as merely about man’s inhumanity man, as in the Holocaust or the Inca persecution, these are symbols that give voice to silent masses and to some of the most indescribable events of modern times. But this is just a part of the message of his work. At the very core of Rogers’s work is the affirmation of life, that, while we live, we ought not to forget the past and we should hold close the memories of others, and that there should be a significant way of passing these memories on to future generations. For Rogers, and for many of the cultures he has dealt with, acts of remembrance are in essence acts of life.